An American tragedy is happening to middle-aged white Americans. Unlike every other age group, unlike every other racial and ethnic group, unlike their counterparts in other rich countries ~ death rates in this group have been rising, not falling. That finding was reported Monday by two Princeton economists, Angus Deaton, who last month won the 2015 Nobel Memorial Prize in Economic Science, and Anne Case. Analyzing health and mortality data from the Centers for Disease Control and Prevention and from other sources, they concluded that rising annual death rates among this group are being driven not by the big killers like heart disease and diabetes but by an epidemic of suicides and afflictions stemming from substance abuse: alcoholic liver disease and heavy overdoses of heroin and prescription opioids. "But veterans experts estimate that 17 of the 22 daily suicides involve vets not enrolled in the VA's health care system, suggesting more research -- and far greater funding -- will be necessary to get a handle on the problem." The 2014 Fort Hood shootings once again brings to the surface the heavy fallout from the use of symptom based psychiatric drugs, versus source based alternative therapy, in treating our wounded veterans ~ whereas the dramatic increase in Military suicides directly coincides with the dramatic increase in dangerous psychotropic drugs. No one really talks about the psychic damage that combat veterans feel when they take someone’s life, regardless of the military situation ~ but the effect is real and usually manifests itself as shame based guilt whereas the innate deep need to love and accept love is quite often permanently disabled. Citizens Commission on Human Rights (CCHR) says that rather than continually send heartfelt condolences to the families of the victims, it is time for lawmakers to investigate the connection between prescription psychiatric drugs and violence, including suicide.
" The military long has been aware of the increasing number of military suicides and last August released the findings of the Department of Defense (DOD) 2013 Study title "Risk Factors Associated With Suicide in Current and Former US Military Personnel. While psychiatric drug information did not make it onto the questionnaire, CCHR explains that there is ample data to support an investigation into the increasing number of psychotropic drugs prescribed to military personnel and the part the drugs may play in the recurring violence." · # Since 2002, the suicide rate in the U.S. military has almost doubled. · # From 2009 to 2012, more U.S. Soldiers died by suicide than from traffic accidents, heart disease, cancer and homicide. · # In 2012, there were 349 suicides among active duty military personnel - more than were killed in combat in Iraq and Afghanistan. · # Veterans are killing themselves at a rate of 22 a day - one every 65 minutes. · # The U.S. Department of Defense now spends $2 billion a year on mental health alone. · # The Veterans Administration's mental health budget has soared from less than $3 billion in 2007 to nearly $7 billion in 2014. 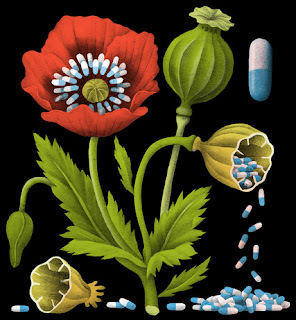 · # From 2005 to 2011, the Department of Defense and the Veterans Administration increased their prescriptions of psychiatric drugs by nearly seven times. That's more than thirty times faster than the civilian rate. 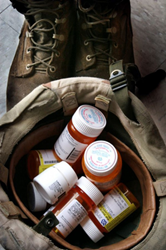 · # One in six American service members is on at least one psychiatric drug. · # Thirty-seven percent of recent war veterans are being diagnosed with PTSD and 80 percent are of those are prescribed a psychiatric drug. But there is a proven Heart Centered approach to PTSD which I have both facilitated over the past five years as well as mentored the past year as a heart centered volunteer ~ a program which concentrates on gratefulness and forgiveness and focuses on self-healing versus medication. For my whole life, all 81 miraculous years, I have sensed a great truth and actually felt it as a young child ~ that deepest within us is love and that all-consuming love is connected to everything we see and all of nature. My whole life has been a quest to find a delightful child within myself whose heart was so deeply touched by my grandfather that I could literally feel love leap from my heart towards him ~ and I seemingly sensed that within that love I was an integral part of something far greater than myself. When I was taken away from my grandfather at 6 years old my heart closed and it became a buried treasure that I spent much of my life looking for. It was only when I totally surrendered to love and eventually the pain of seemingly losing it, that I fell into a rabbit hole of love, joy and soul consciousness (the Unified Field) beneath that pain ~ along with a growing awareness of my eventual part in this universal loving plan whose principle property is the urge to unite. In my role as a heart centered life coach ~ I meet my clients from a place of celebration and service and invite them to take their turn! Initially, each one of these participants complete a Life chart ~ a chart which clearly shows their whole life, relationships and war or life experience as a Quest or journey to eventually find themselves. From our very first session, they begin the process of thanking the people who have been there in their lives and as they do ~ like flowers, their buried or numbed out hearts begin to open allowing them to see through different eyes. Make no mistake about this self-healing process ~ for my clients are healing themselves through their homework and action. I touch them from a place of celebration and service and I'm not afraid of their deepest fears for I know and demonstrate that beneath that level of pain and aloneness is a Unified Field of love, joy and celebration as well as their authentic vocation within a universal loving plan. 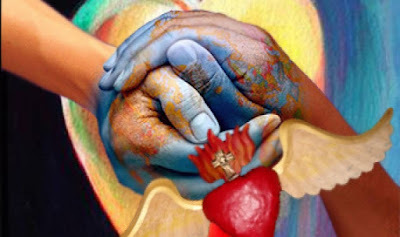 In my work, as a consultant and heart centered life coach, with clients with PTSD or PTHD ~ I concentrate, with great success, on them opening their hearts ~ initially through gratefulness toward the people and friends who have been there for them and finally to giving and accepting love themselves. They eventually forgive themselves in the process of opening their hearts as well as begin to see through different eyes ~ and medication becomes no longer their only option or escape from America's growing tragedy. The power and truth of a heart centered approach to self-healing has withstood ridicule and then opposition within the VA and medical pharmaceutical community ~ but it is now fast approaching the stage where its acceptance and value are self-evident.